Below you will find free craft instructions for many general craft projects. This is a great place to come when your child wants to make a gift for someone or a little something for themselves. You will also find many projects here for the more advanced crafters. Be sure to check out our other categories for more specific project types such as sewing, knit and crochet and holiday crafts. 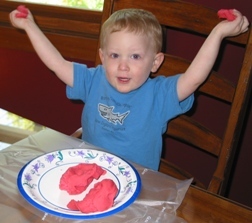 This tried and true play doe recipe has been around for years and produces a soft, smooth, non-toxic dough for children to play with. This fun fashion scarf is made from pompoms strung together. This easy kids recycling craft allows kids to experience the joy of painting and learn about recycling at the same time. Made of craft foam, this easy kids craft is holds sunglasses or regular eyeglasses and would be a great Mother's Day or Father's Day gift. Learn how to turn an ordinary teddy bear into an adorable air freshener. Complete directions for easy to make hair bows from lace. Great gift idea! Let kids make this easy picture frame as a Mother's Day, Father's Day or Christmas gift. Easy kids craft. No sewing required to make this hair scrunchie. With no sewing needed this blanket can be made by almost anyone who can cut and tie a knot. Make a unique candle to give as a gift or enjoy yourself. This crackle candle contains air pockets in the outer layer of wax which allows the glow of the candle to show through. If you have puzzles with missing pieces and don't like to waste anything, this craft project is for you. Here we will share how to color ordinary sand for your sand art projects. It is an inexpensive fun way to keep kids entertained.